As we learned again recently, professional creatives tend to get prickly when asked to do work for no compensation. But is it always a bad idea to work for free? 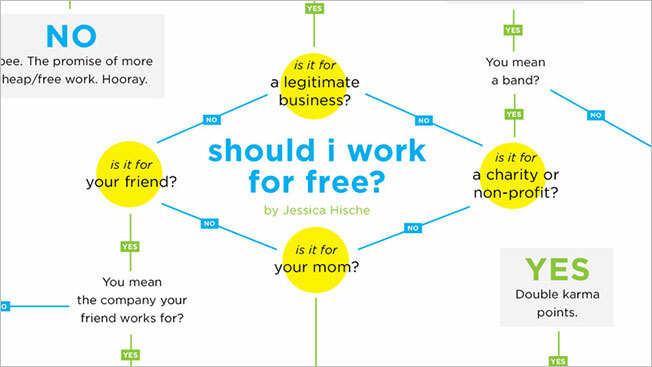 Jessica Hische's handy flowchart should help you decide. It's divided into four main types of jobs, and from there you snake around answering various pertinent questions—and hopefully reaching a satisfactory conclusion to your particular situation. Notably, the "Is it for a legitimate business" section yields only "No" answers. That's debatable, but Dan Cassaro would be proud. Click here to see the full flowchart.